Ethernet remote monitoring support a graphic user interface, based on a WEB server and at least on M2M protocol. This determines the two main alternatives for their usage – stand-alone or as a part of SCADA system. The graphic user interface (GUI) helps the stand-alone usage. No need for special software to work with the devices. All settings and subsequent remote monitoring and control are carried out in a standard browser – Chrome, Firefox, IE, Opera, etc. Ethernet is the most widely installed local area network (LAN) technology. Ethernet is a link layer protocol in the TCP/IP stack, describing how networked devices can format data for transmission to other network devices on the same network segment, and how to put that data out on the network connection. Ethernet is a network protocol that controls how data is transmitted over a LAN. Technically it is referred to as the IEEE 802.3 protocol. The protocol has evolved and improved over time and can now deliver at the speed of a gigabit per second. An Ethernet controller is a piece of computer hardware that manages and maintains a computer's connection to a wired network. The Ethernet controller thus plays an integral role in Internet usage and other network functions. A software driver controls the on-board functions of the network device. A building management system BMS is a computer-based control system installed in buildings that controls and monitors the buildings mechanical and electrical equipment such as ventilation, lighting, power systems, fire systems, and security systems. A BMS consists of software and hardware; the software program, usually configured in a hierarchical manner, can be proprietary, using such protocols as C-Bus, Profibus, and so on. Vendors are also producing BMS's that integrate using Internet protocols and open standards such as DeviceNet, SOAP, XML, BACnet, LonWorks and Modbus. Controllers for general remote control, server room monitoring, SCADA, home and industrial automation over Ethernet. 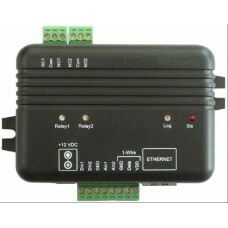 Ethernet I/O module with advanced full-calender schedule relay control. M2M protocols support– MODBUS TCP/IP, SNMP and HTTP API. Ethernet Relay Control TCW181B-CM is 8-channel remote relay board, which is designed to work ..
Ethernet I/O module TCW241 provides four digital inputs and four analog inputs. 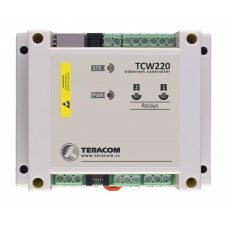 Its 1-Wire interfa..
TCW122B-WD is an Ethernet controller, specially designed for IP watchdog monitoring. 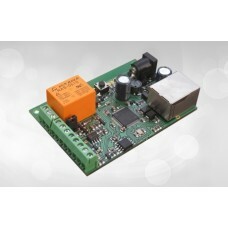 It controls t..
TCW112-WD is IP watchdog board. 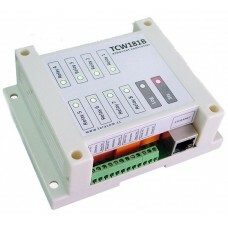 It can control functionality of IP based devices and networks..
TCW112-CM is environmental IP monitoring board. 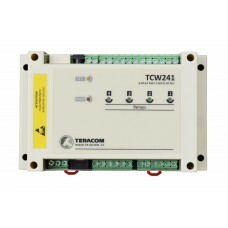 It is designed to be managed by WEB interface, SNMP ..
TCW122B-CM utilizes special schematic for long 1-Wire interface support, up to two temperatur..
TCW122B-RR is an Ethernet based remote relay control module that has two digital inputs and t..
Ethernet data logger TCW220 for general data acquisition applications. It has 2 analog inputs,..